The location of genes and regulatory elements within this chromosomal framework could help scientists better navigate their genomic research, establishing relationships between mutations and disease development. In order to regulate gene expression, a regulatory element needs to contact its target gene. Through looping, element/gene partners that are distant from each other in linear DNA can be brought together. Most disease mutations occur in regulatory elements, but if the partnership between a seemingly far-flung gene and the regulatory element is not known, the mutation data is of limited use. This draft map, which can help scientists predict the relationships between mutated elements and their target genes, is described online. “When thinking about disease, we need to think about the structure of the genome in 3D space because that is how we now understand that genes are regulated,” says Xiong Ji, a postdoctoral researcher in the Young lab and a co-author of the paper. 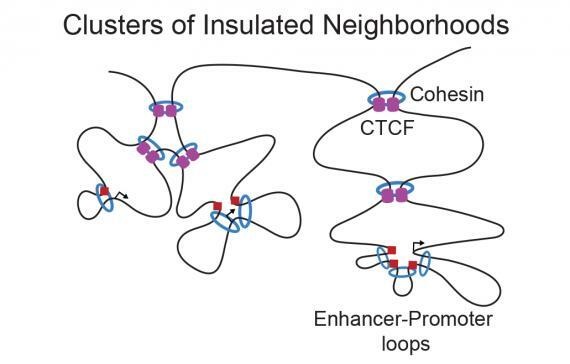 By studying human ES cells, scientists in the Young lab and the lab of Whitehead Founding Member Rudolf Jaenisch created an initial genome map consisting of 13,000 loops established by CTCF anchors and determined that the average insulated neighborhood is 200 kb in length and contains a single gene. The team found that most of the the mapped CTCF anchor sites in the human ES cells genome are maintained in other human cell types and furthermore, that these loop anchor sequences are highly conserved in primate genomes. Such a surprising degree of conservation indicates that these neighborhoods create a foundational framework for gene regulation that is maintained throughout development and across species. In a further finding that underscores the importance of the genome’s 3D structure in human health, the Whitehead team found that the CTCF anchor regions are mutated in a broad spectrum of cancer cells. The team predicts that these new maps of the human genome will provide the foundation for improved understanding of the genetic alterations that cause many additional diseases.